Can you have multiple offset accounts? Yes and no. In general, you can only have one offset account linked to one loan. There are some lenders who do allow you to have multiple offset accounts linked to one loan but the majority of lenders do not. 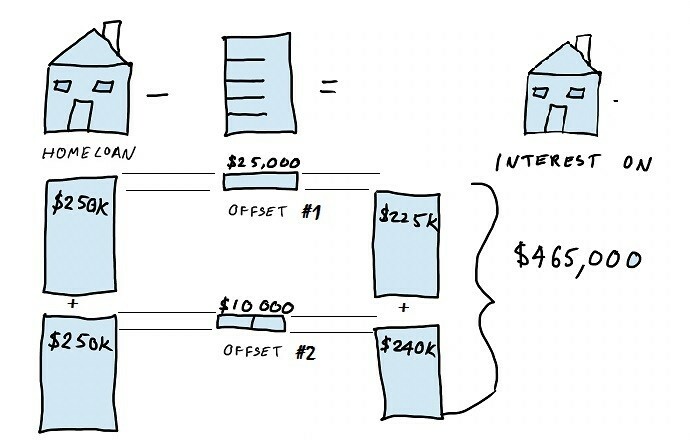 So how can you have multiple offset accounts? If for some reason you do want multiple offset accounts, the easiest way is to split your variable rate loan in two. Then you have one loan linked to one offset account and another loan linked to the other offset account. This also applies to having three or more loans and offset accounts. For example, assume you have a $500,000 home loan split into two: $250,000 and $250,000. You have one offset account linked to one loan and another offset account linked to the other. You have $25,000 in one offset account and $10,000 in the other. The total interest you will be charged on is $250,000+$250,000-$25,000-$10,000 = $465,000 (another awesome diagram shown below). Have a read of what to look out for when you have an offset account here. As mentioned above, there are some lenders who allow you have have multiple offset accounts linked to the one home loan. We think this is a great product and structure because it allows you to set up your offset accounts in a more realistic way. For example, most people when they save don’t say “we need to save $40,000 to pay for a new kitchen, holiday, kids bikes and a new iphone”. In practice, most people itemise how much they need to save and also prioritise what is more important. They may say $25,000 for a new kitchen is most important, then $500 for new kids bikes, $1000 for new iphones and last but not least $13,500 for a holiday. There are a few lenders who allow you have have these multiple offset accounts and they all add up to offset one home loan. A few of our clients have set up their offset accounts this way and have loved it. There is a limit of 7 offset accounts however but that is per loan. If you want more, you could split the loan in to two.